Who knew that traditions could be invented overnight? I thought, foolishly, that a tradition was the passing of a custom or belief from generation to generation, and yet there’s a new tradition on the block that’s whipping young couples into a frothy frenzy of must-have-ism. 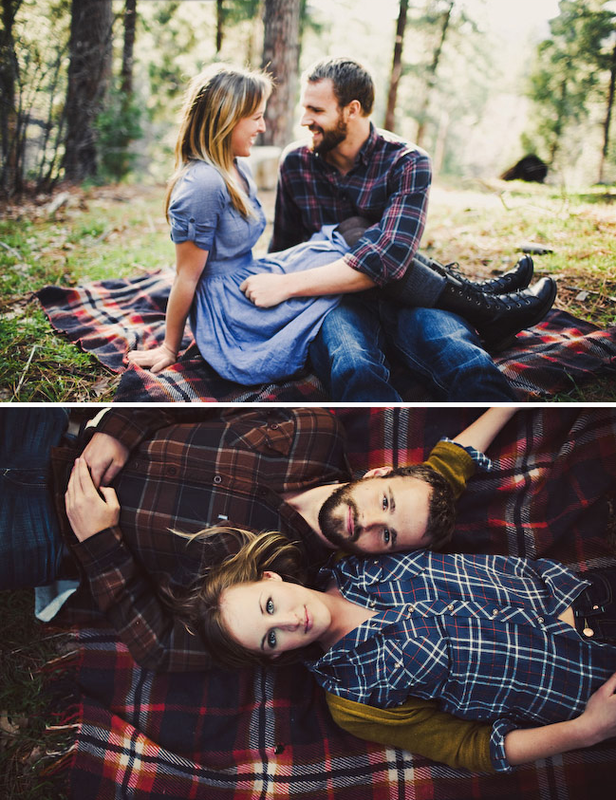 Engagement shoots, or, as they’re known in the blogosphere, ‘e-sessions,’ (with a ‘Wedding Artist,’ no less). The ‘wedsite’ world and its dedicated community have engagement fever, as hoards and hoards of new couples attempt to proclaim their love and their individuality through pre-nuptial portraits. From a reimaging of the Notebook to a Zombie rampage, couples are breaking away from the formalities of traditional photography and embracing the emancipation of the individual. There are, of course, plenty of stock images around, where the happy couple are kissing or holding hands or looking at a sunset or cuddling mawkishly next to a tree, but more often than not the nearly-newly-weds are using the medium to express their day-to-day style and character. Whilst, of course, the digital world requires the human being to catalogue everything in images, from today’s outfit to tonight’s glass of wine, how far can a couple go to declare their love before it becomes overbearing and what, if anything, do these e-sessions have to offer in a practical, photographic sense? By and large, a photographer will offer the engagement shoot as part of their wedding package and this, they stipulate, is an integral aspect of successful wedding photography. Andy Stonier of Howling Basset, a wedding photographer in Kent, says, “Whilst engagement shoots are great fun, that’s not their only purpose. They provide an important opportunity for the couple and the photographer to meet in a relaxed setting, where they can prepare for the big day. By getting to know the quirks and comfort zones of the couple in question, the photographer can produce superior wedding pictures.” And sure, many bride-groom’s, bride-bride’s and groom-groom’s find themselves completely overwhelmed by the focus of so many lenses. If engagement shoots allow the subjects to get familiar with their photographer, whilst simultaneously looking loved-up and framing something pretty for the mantel piece, then it seems like a fail-safe plan. After all, any professional (or, indeed amateur) photographer knows how difficult it is to capture a natural moment with an awkward subject. Whether you get the right angle or not, there’s no removing that lack of trust from their eyes and no amount of retouching can beautify the camera shy. Therefore, considering wedding photographs are (hopefully) a once in a life time chance, it makes complete sense to do a casual rehearsal. However, the cynics are already bearing arms. According to them, engagement shoots are merely a fad that’s been created by clever marketers in the wedding industry, by way of goading gullible couples into parting with their savings. By that logic, then, the same can be said of Valentine’s Day, Christmas Day, Mother’s Day and all of those card shop holidays that guilt us into gift-giving? And yet that doesn’t stop us from taking part and feeling special. In my humble opinion, engagement shoots are harmless and they look like a hell of a lot of fun. I know that when (if) I get married, I’ll want some time with my photographer before the big day because I am naturally oafish in front of a camera (especially if there’s a stranger behind the lens). Also, on some occasions, the creative innovation and photographic ingenuity at play in these shoots is genuinely astounding. Ultimately, I support any opportunity for creative expression, especially where photography is concerned and particularly in the name of love. And sure, these engagement shoots might seemingly reflect an unattainable Hollywood dream that’s fun to watch but ultimately unrealistic, but, you know, who cares?